apex implements new classes and methods for analysing DNA sequences from multiple genes. It implements new classes extending object classes from ape and phangorn to store multiple gene data, and some useful wrappers mimicking existing functionalities of these packages for multiple genes. This document provides an overview of the package's content. 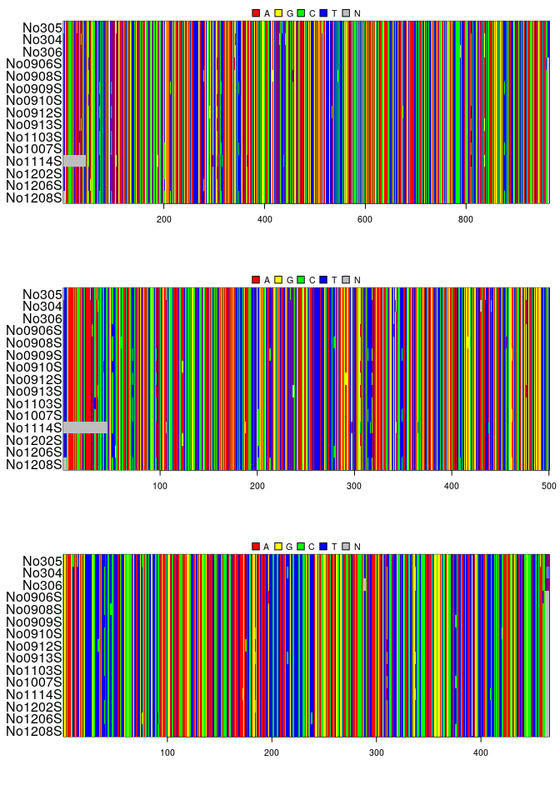 ## 8 DNA sequences in binary format stored in a matrix. 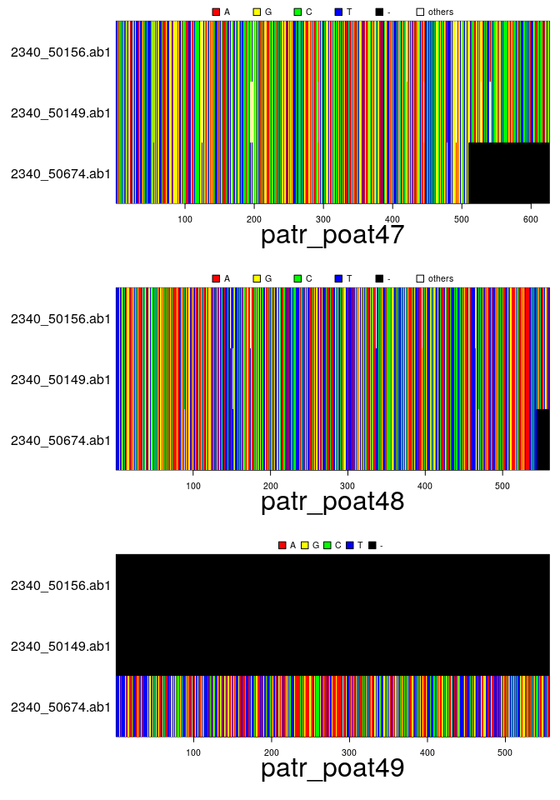 ##  "patr_poat43" "patr_poat47" "patr_poat48" "patr_poat49"
## 8 sequences with 764 character and 8 different site patterns. ## 8 sequences with 626 character and 29 different site patterns. ## 8 sequences with 560 character and 24 different site patterns. ## 8 sequences with 556 character and 8 different site patterns. 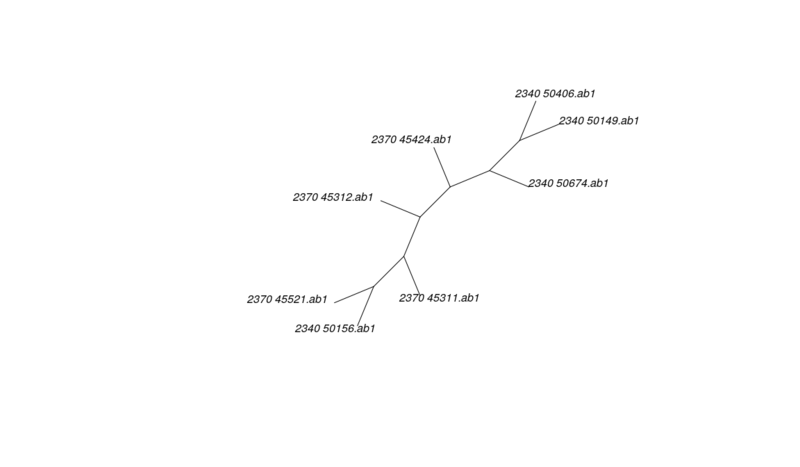 multidna: based on ape's DNAbin class, useful for distance-based trees. multiphyDat: based on phangorn's phyDat class, useful for likelihood-based and parsimony trees. Conversion between these classes can be done using multidna2multiPhydat and multiPhydat2multidna. Any of these slots can be accessed using @, however accessor functions are available for most and are preferred (see examples below). We illustrate the use of the constructor below (see ?new.multidna) for more information. 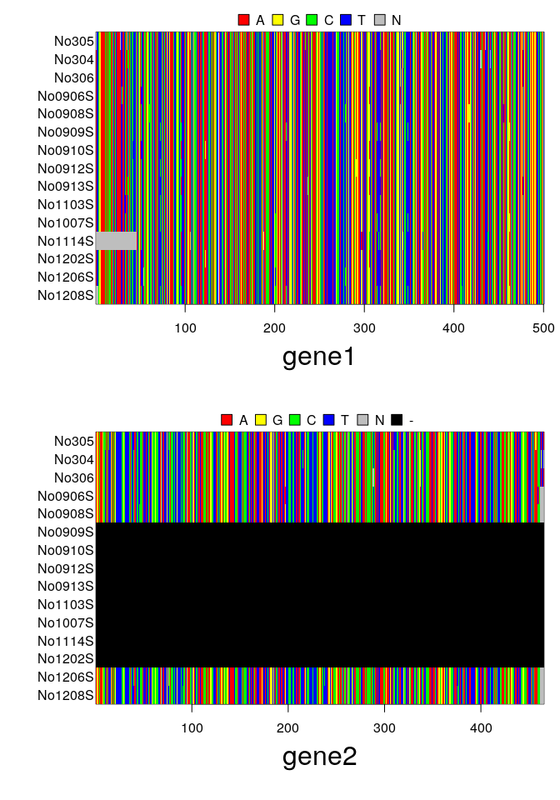 We use ape's dataset woodmouse, which we artificially split in two 'genes', keeping the first 500 nucleotides for the first gene, and using the rest as second gene. Note that the individuals need not match across different genes: matching is handled by the constructor. 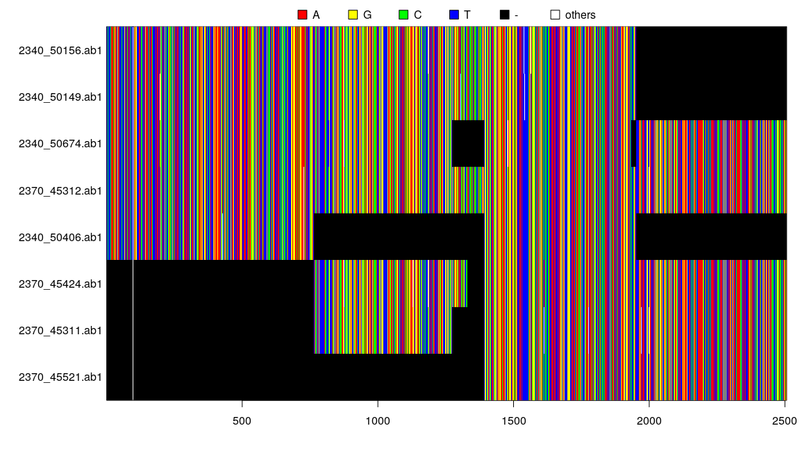 ## 15 DNA sequences in binary format stored in a matrix. ##   "No305"   "No304"   "No306"   "No0906S" "No0908S" "No0909S" "No0910S"
##   "No0912S" "No0913S" "No1103S" "No1007S" "No1114S" "No1202S" "No1206S"
## 15 DNA sequences in binary format stored in a list. Any of these slots can be accessed using @ (see example below). As before, we illustrate the use of the constructor below (see ?new.multiphyDat) for more information. ## 47 sequences with 3179 character and 1605 different site patterns. ## 47 sequences with 1600 character and 827 different site patterns. ## 47 sequences with 1579 character and 844 different site patterns. ## 8 sequences with 2506 character and 69 different site patterns. 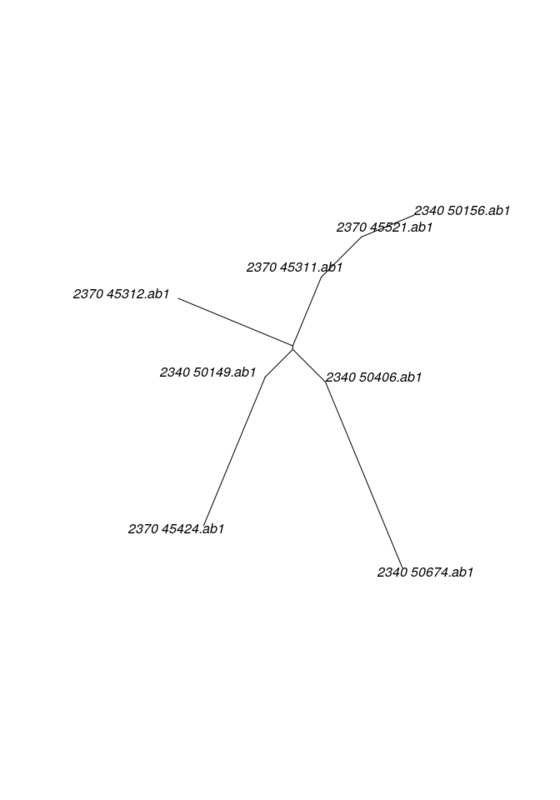 ## Phylogenetic tree with 8 tips and 6 internal nodes. 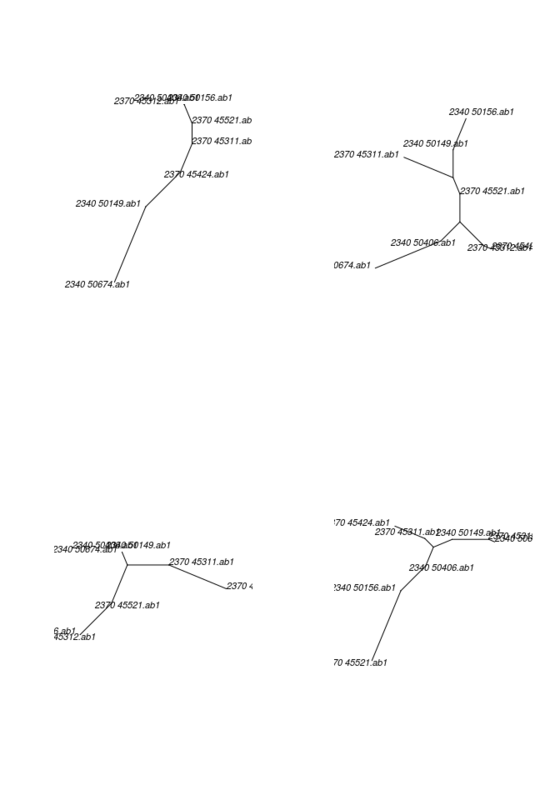 ## Unrooted; includes branch lengths. 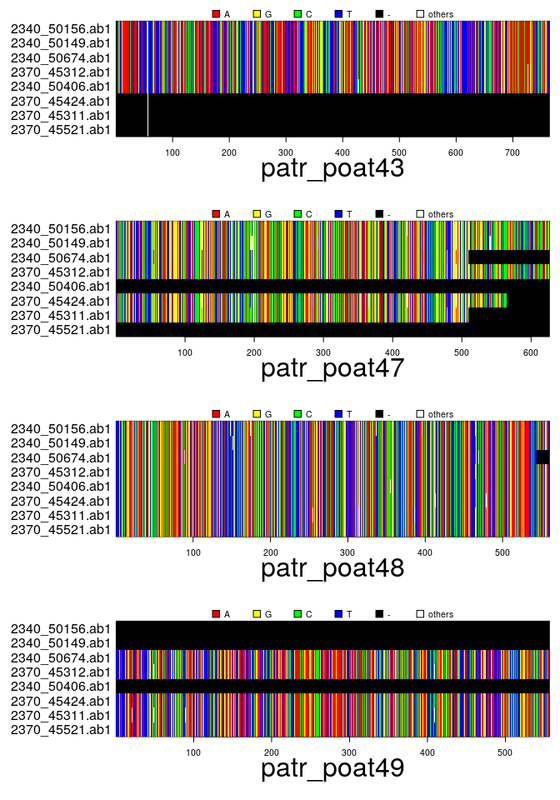 multidna2genind: concatenates genes and export SNPs into a genind object; alternatively, Multi-Locus Sequence Type (MLST) can be used to treat genes as separate locus and unique sequences as alleles.